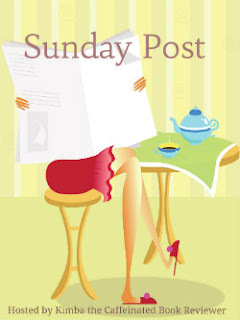 The Sunday Post 3.3.2013. My recap of what I posted/did/whined about the week prior. My jaw drops a little more each day when I see the number of people who are on tenterhooks awaiting news of the release date for Emerald Green, the last book in Kerstin Gier’s Ruby Red trilogy. Well, wait no more! According to Amazon.com, a date has been chosen. By sheer coincidence, I had written about the movie version of Ruby Red that comes out in Germany this coming week. Here’s hoping they distribute it here in the states as well (or wherever you are!). On Monday, I posted about some challenges that I am undertaking during the month of March. Yes, I did read and review some books this past week. The first one was Spell Bound by Rachel Hawkins, the last in the Hex Hall series. A new book, The Nightmare Affair by Mindee Arnett, was published this week. Click on the link to see what I thought of it. Next I reviewed Cindy Ella by Robin Palmer. On Thursday, I participated in a book meme called Booking Through Thursday for the first time. Friday is Feature and Follow Friday, and the question was an interesting one…what book did you love and your friends didn’t or vice versa? Lastly, on Saturday, I posted my essay Happy Spring Break! What New Books This Week, eh? We’re starting the second week of this fun (and rewarding!) book challenge. This Friday starts the challenges, which *ahem* happens to be mine. Check in on Friday for the fun! I’ve just finished reading Uglies by Scott Westerfeld. A review will be posted this week. Grrrr…I have GOT to finish Rapture by Lauren Kate, Dysfunctional Romance by Derick Hudson, and Three Graves Full by Jamie Mason. The question is: will I? Need to finish Biting Cold by Chloe Neill. Must read three library books: The Fine Art of Truth or Dare by Melissa Jensen; The Reece Malcolm List by Amy Spalding; and Scarlet by Marissa Meyer. I am going to read a couple of books for which reviews were requested, too. I will post my fav memes if I have time. That’s it for this week. Check in next week to see how I did! Me, too! I am trying to coordinate all of my diff book challenges to get ready so I am MOST efficient! Hope you have a fabulous week ahead. Happy reading. Enjoy your new books. Thanks, Jenea! You, too. Are you participating in the Take Control of Your TBR list challenge?